Clearly, Olathe North was able to flex their muscles in this game. Simone hopeful James Franklin totalled 132 rushing yards and two touchdowns on 15 carries. Joining him in the backfield was Kansas State commit Tre Walker, who added three rushing touchdowns of his own. The Eagles dropped half-a-hundred on Leavenworth by halftime, and went on to score three more touchdowns in the second half. This game came as a bit of a surprise, but after looking at the box score it makes sense why Olathe East came out on top. Lawrence Free State, the more seasoned of the two squads, committed five turnovers, four of which came on interceptions. Firebird quarterback Camren Torneden passed for 151 yards, and rushed for 62 yards and two touchdowns, but ultimately the three interceptions he threw hurt the Firebirds quite a bit. Olathe East fed off the turnovers and played a very disciplined game in coming out on top. Olathe South's steady passing game was nearly enough to take down the Vikings Friday night. Falcon quarterback Tanner Dutton completed 29 of 47 passes for 315 yards and one touchdown, but SM West showed alot of grit in winning the game. Olathe South started out hitting on all cylinders--to the tune of a 13-0 lead. But SM West, led by 166 rushing yards from junior Will Livingston, battled back to gain a halftime lead. A late pick six by SM West senior Alex Snook solidified the victory for the Vikings. The Indians of SM North put a bit of a damper on the night that unveiled the new football stadium at Lawrence High. SM North used a balanced rushing attack of Kendall Kelly (below) and Arthur Rucker to wear down the Lawrence front seven. Lawrence also turned the ball over three times on fumbles in the loss. Despite having two key players injured (John Hauk and Trey Jacobson), the Cougars of SM Northwest were able to grind out a win. Quarterback Matt Nowak completed 12 of his 16 pass attempts for 135 yards and a touchdown. He also ran the ball six times for 32 yards and a touchdown. 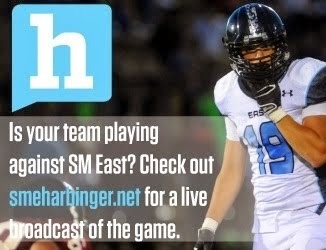 Chip Sherman's first game as head coach at SM East, a Thursday night contest, ends in defeat. Olathe Northwest's Brandon Bouvilom rushed for two touchdowns and helped Olathe Northwest's head coach, Todd Dain, defeat his former school.